There are many things about Landscape Photography that make so much sense to me but I have to say one of my favorites is the not knowing. You can plan this and plan that but so many different elements have to come together for it to feel right. This shot is a perfect example of the not knowing, I’m standing in the dark at a location I had never seen before wondering is this the day Mother Nature will share some of her color. If she gives me at least a chance I will connect with whatever is in front of me and do her proud. Anglins Pier first opened on November 24, 1963. 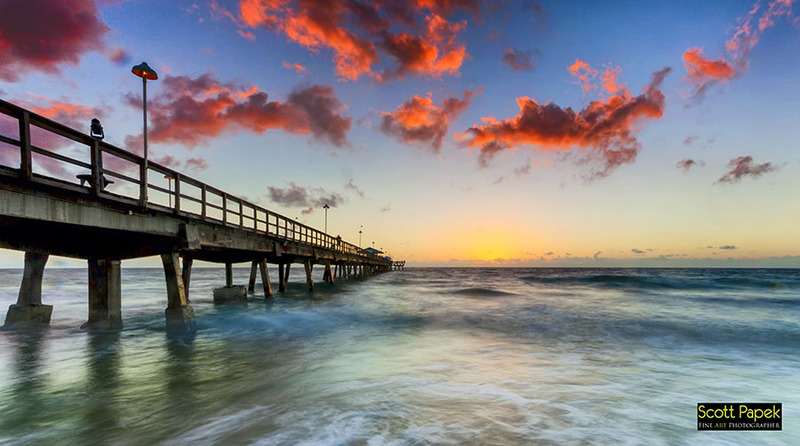 It has been, and still is today, an important part of the City, Lauderdale by the Sea, offering tourists and fishermen a great time. Photo © copyright by Scott Papek.